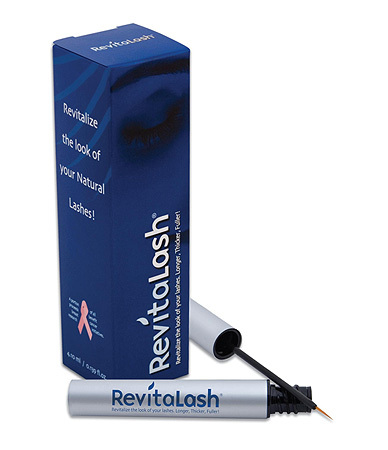 RevitaLash® Eyelash Conditioner was developed by an ophthalmologist who was motivated to create a safe cosmetic product to enhance the beauty and attractiveness of women’s natural eyelashes after his wife’s eyelashes were devastated by chemotherapy treatments for breast cancer. Unspecified portion of all proceeds to benefit breast cancer research initiatives throughout the year, every year. Please phone 020 8997 8541 or visit www.skinbrands.co.uk for stockist details. I think this is a really sweet innovation… but does it work? I’m scared to try ANY lash enhancing products in case my eyeballs turn brown/fall out of my face! I’ve tried Latisse and it works 100%. I stopped because my lashes got too long… I’ve never reviewed it on here, because of the potential side effects (eyelid discoloration and iris colour changing) – gruesome. I love this company because they really mean what they say. They don’t donate 1 month a year to gain business, they donate all year long. They were kind enough to donate Hair by RevitaLash to a local cancer charity for teens in my area and I’ll always support them because of that.